They are a good size! lovely! Oh there're beauties...... I have two which I thought looked nice, but they are not as big as these. Lovely shot, not easy to photo ! Wonderful flowers. Such a lovely shape and colour. 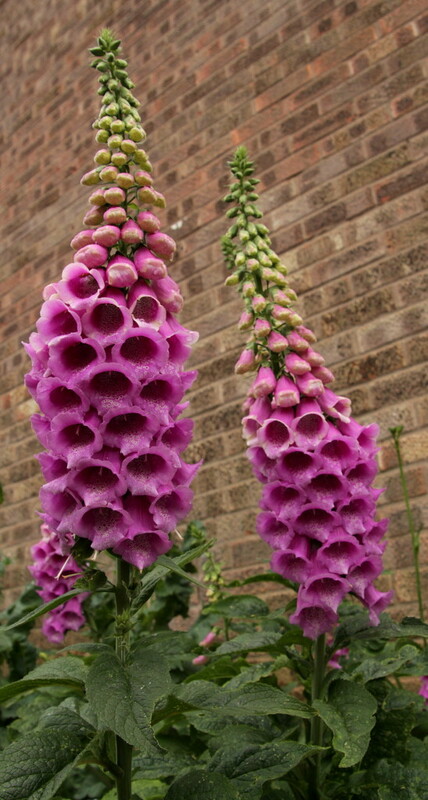 I have two skinny foxgloves in my garden and your fabulous plants put mine to shame! Lo! Two beauties! Fav! Amazing foxgloves must have broken the record for the huge amount of little gloves. They are beautiful, we don't see them here, but I did spot some in New Zealand a couple of years ago. These are laden with blossom. Nice. Gorgeous spires - they really are stunning and you've captured them perfectly, looking up. Beautiful ...love your composition and textured background.